It was only two years ago that Steve Ballmer, the former Microsoft CEO, plunked down $2 billion to buy the Los Angeles Clippers. Since then he has brought his tech background to the squad forcefully: He announced his intention to techify the Staples Center; he wants the team to use Microsoft Surface tablets instead of Apple iPads. You might think the Clippers are, by default, the tech industry’s NBA team of choice. But techies have chosen the Warriors. Golden State won the NBA Finals last year and its star player, Stephen Curry, was the MVP of the league. This year the team is in the Finals again, and Curry is the MVP again. The team’s 73 regular-season wins set an all-time record. And as the team has risen to the top of the NBA, luminaries of Silicon Valley have eagerly hopped onto the bandwagon. Of course, it isn’t just about the team’s success on the court, or about the stadium’s location in Oakland, a 30-minute drive from San Francisco. Everything about this Warriors team makes it candy for tech luminaries, even those who never cared much about basketball. 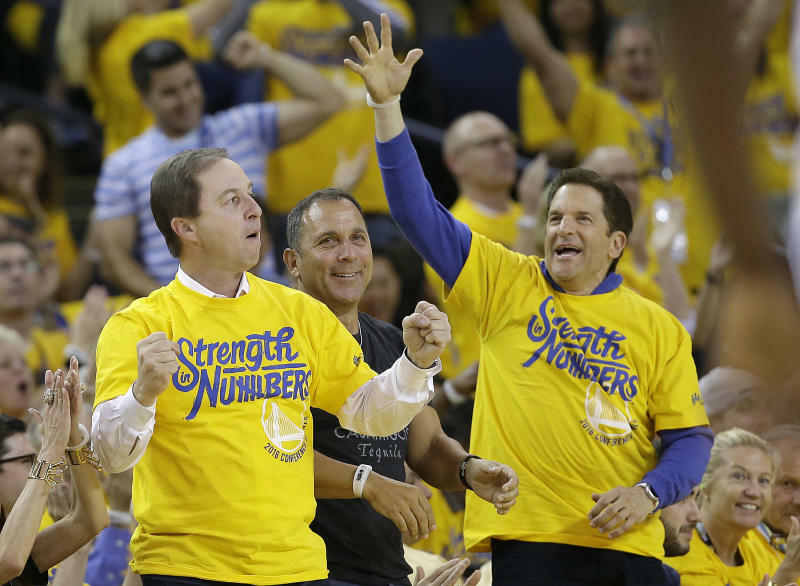 The majority owner of the Warriors is Joe Lacob, a longtime partner at venture capital firm Kleiner Perkins Caufield Byers, whose investment group Mandalay Entertainment bought the team in 2010 for $450 million, beating out buyers that included Oracle cofounder Larry Ellison. Yes, there are other teams, like the Memphis Grizzlies and the Sacramento Kings, that are owned by techies who made their money in Silicon Valley. But Lacob’s ownership group includes a veritable tech locker room Mandalay include fellow Silicon Valley VCs like Chamath Palihapitiya, a former Facebook executive, Mark Stevens of Sequoia Ventures, Bob Kagle of Benchmark, and John Walecka of Redpoint Ventures. Lacob brought his business mentality to the team, and the techie fanbase followed. Ticket prices went up; even seats in the nosebleeds can run $500. (The median ticket price for the NBA Finals games in Cleveland is $899, according to ticketing site Vivid Seats; median price for the games in Oakland is $1,483. And the median ticket price for a possible Game 7 on June 19 in Oakland? A staggering $2,081.) It’s created “an affordability issue,” says Bob Dorfman, a sports marketing expert in the Bay Area with Baker Street Advertising. But that’s no problem for the folks in Silicon Valley, who have expendable income galore. For them, it’s become hip (arguably even necessary) to be seen at Warriors games, which Dorfman says is "a social scene and networking opportunity." Salesforce CEO Marc Benioff, WhatsApp founder Jan Koum, Apple exec Eddy Cue, mega-influential tech investor Ben Horowitz, and musician and tech enthusiast Will.i.am have all been spotted courtside cheering on the Warriors. To be sure, not everyone loves the current Silicon Valley sheen of the NBA’s best team. In an interview earlier this year with the New York Times, Lacob promised more titles and suggested that the team’s record on the court is thanks to the decisions of its ownership. “The great, great venture capitalists who built company after company, that’s not an accident... And none of this is an accident, either,” he said. Warriors now 1-2 at home since owner Joe Lacob revealed to New York Times Magazine that he's smarter than everyone else. Indeed, in three seasons the Warriors will ditch Oakland for the techified sidewalks of San Francisco’s Mission Bay neighborhood, where JPMorgan Chase (JPM) will finance a brand new stadium and get naming rights. (So long, Oracle Center.) It isn’t public how much JPMorgan paid for the Chase Center, but it was reportedly even higher than the record-high $200 million Barclays spent for naming rights to the Brooklyn home of the Nets and now Islanders. “The entire Silicon Valley area is rallying around this team,” says Chris Orton, CMO of Fanatics, which is based in the Bay Area. This week, he says, “It feels like everyone is wearing some type of Warriors item.” And with the San Jose Sharks also playing in the NHL’s Stanley Cup Finals this week, Fanatics says the Bay Area has become the No. 1 top-selling market in the country for all licensed sports merchandise. Call it an embarrassment of riches—kinda like what the Warriors have right now.